For many of you it is holiday time and you may have other things on your mind. But if you have an hour to spare in the coming days I would like to recommend watching the video below. It is a very interesting presentation by Fred Young, which he gave on 4th February 2013 in Seattle after his trip to the Netherlands in November 2012. The presentation was published on the Seattle Neighborhood Greenways website. Fred Young at his presentation in Seattle. 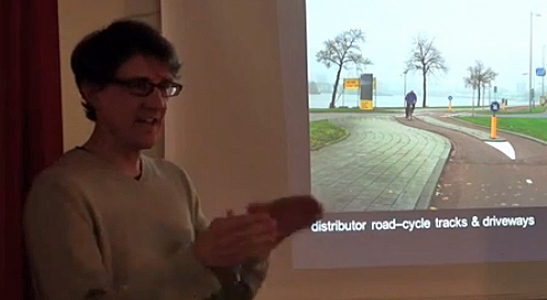 He looked at Dutch cycling infrastructure from an American perspective and he understands what he saw well. He is also able to tell about it in a very entertaining way. Some of the sites he has visited also featured on my blog so you may recognize things. One little remark, at 14:10 Fred mentions that the speed in a “Woonerf” (home/living zone) usually is 30km/h (19mph) but that is not correct. Originally the speed limit was “walking pace” which was not an exact number. Under pressure of the European Union it had to become a figure and that was set to 15km/h (9.3mph). That is why sometimes you see a little extra 15 sign. Recently back from a 600-mile bicycle journey through northern Europe, Fred’s goal was to experience some of the best bicycle, pedestrian and public transportation facilities in the world. He rode his bike from urban centers to rural villages, transitioned from bike to public transportation, and navigated by using maps and local wayfinding systems and maps. He took 5,000 photographs along the way, some of which he shared in this interactive evening event. Great info, nice mix of anecdotal and systematic presentation of the Dutch cycling system. I’m a Tacoma native living in the South of France (city: Perpignan), and over the past several months I’ve started biking heavily (admittedly, for pleasure, not for transportation, which is of course a different ballgame), and thinking about the infrastructure. One huge obstacle to a good biking system in Seattle (or Tacoma) is the hills. How do you get someone from the waterfront to the top of Capital Hill? (It’s hard enough in my ’87 manual transmission Honda Accord.) A flat crowded city (Dutch city) doesn’t have to deal with some of these problems, obviously. Electric assist bicycles are making it possible to ride longer distances and up sharp inclines without nearly as much effort as you would need with a bicycle without power assist. I wish all of the USA would learn more from this. I ride everyday and I love riding to work and around town. Down in Arizona we do have some bike paths, but on the road we have a bike lane but it’s just right next to the moving cars. I think if we had move safe lanes for bikes more people would ride. Fabulous presentation. Nice to see this from the American point of view. In Holland we’re pretty convinced that the Dutch/Danish/German model is the best because we’re enjoying it everyday. Seeing the discussion makes you realize that there are more people and groups which strive for the same goals. The problem is that it’s not one measure or idea that brings change. It’s a complete system, a network that has to be developed. You can only do that on a big scale and with the help of generally felt consensus. It’s also a cultural thing therefore and that takes time. Sites like this and presentations like this can help definitely. As far as I know, the 15 kmh limit is not based on EU pressure, but on a decision by the Hoge Raad (highest Dutch court) from 1999. Also, for clarity, the word “stapvoets” that is translated by “walking pace” here, originally means “using walking gait” for horses. Thus, it originally meant “You can ride a horse here with a walk, but not a trot, canter or gallop”. This entry was posted on 22 December 2013 by Bicycle Dutch in Original posts and tagged bicycle culture, campaigning, infrastructure, United States (USA).